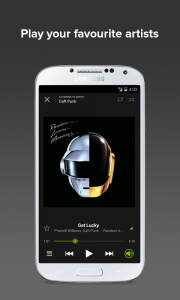 Spotify has announced recently that its app for mobile devices is now free for all users. From now on, users of smartphones and tablets can enjoy the same benefits as computer users. Spotify is an application used for playing music via streaming, available for Windows, Mac, Linux, Windows Phone, iOS, Android, Symbian, and Blackberry. With this app, you can listen to music in radio mode and search by artist, album, or playlists created by users. In March 2013, Spotify had more than 24 million users, 6 million with paid subscription. The company has described the features offered by the application, available for iOS and Android. Available to all today – Spotify’s new free mobile experience lets you shuffle play: • Your music: Listen to all the playlists you’ve created and playlists from the people you follow. Spotify lets you discover new music, save, shuffle and share. • Your favourite artists: Want to listen to a certain artist? Just hit shuffle play, sit back and listen to their entire catalogue. Don’t settle for something similar. Don’t settle for just one track from the artist you want to hear every 20 minutes. • Discover great new playlists: Going for a jog or to the gym? We’ve got the playlist to help you go the extra mile. We know you just want the perfect music for a specific moment in time – and we’ve got you covered.There’s something for every mood, genre or moment. One of the strengths of Spotify is its songs’ catalog. With more than 20 million songs is more complete than its competitors. However, it is the social networking component what makes Spotify special. You can send links to songs and playlists, share your lists and subscribe to other users. Spotify has three types of subscriptions, one free and two paid. The free version is funded by advertising offered in the player. There is a limit of 10 hours per month of reproduction and the same song can be reproduced a maximum of 5 times. 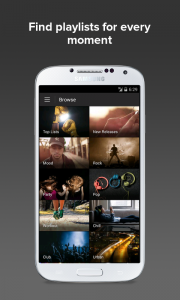 The “Unlimited” version removes ads and restrictions, while the “Premium” version also offers extra features, including access to music off- line and a higher bitrate streaming. You can download Spotify from the App Store and Google Play respectively.